Léonce Rosenberg, Paris, by whom commissioned directly from the artist in 1928. Anonymous sale, Palais Galliera, Paris, 19 March 1973, lot 53. Anonymous sale, Hôtel Drouot, Paris, 8 December 1982, lot 83. M.L. Borrás, Francis Picabia, London, 1985, no. 570, p. 525 (illustrated no. 756, p. 368). Paris, Galerie Georges Bernheim, Exposition Francis Picabia, November 1931, no. 13. New York, Valentine Gallery, Recent Paintings by Francis Picabia, November 1934, no. 1. Le Mans, Musée de Tessé, Cent Ans de Peinture Moderne de Claude Monet à Arman, June - July 1975, no. 44. Brussels, Musée d'Ixelles, Picabia 1879-1953, May - August 1983, no. 47. Tokyo, The Museum of Modern Art, Seibu Takanawa, Francis Picabia, July - September 1984, no. 47; this exhibition later travelled to Tokyo, Seibu Museum of Art, September - October 1984. Madrid, Salas Pablo Ruiz Picasso, Francis Picabia. Exposición antológica, January - March 1985, no. 105 (illustrated p.173); this exhibition later travelled to Barcelona, Centre Cultural de la Caixa de Pensions, April - May 1985. Nîmes, Musée des Beaux-Arts, Picabia, July - September 1986, no. 86 (illustrated p. 88). Paris, Didier Imbert Fine Art, Paris. Capitale des Arts, April - July 1989, no. 17. Paris, Didier Imbert Fine Art, Picabia, April - July 1990, no. 48 (illustrated p. 126). Nice, Musée d'Art Moderne et Contemporain, Picabia et la Côte d'Azur, July - October 1991, no. 35 (illustrated); this exhibition later travelled to Gijon, El Palacio Revillagigedo, Centro Internacional de Arte, November - December 1991 (titled 'Picabia entre guerras'). 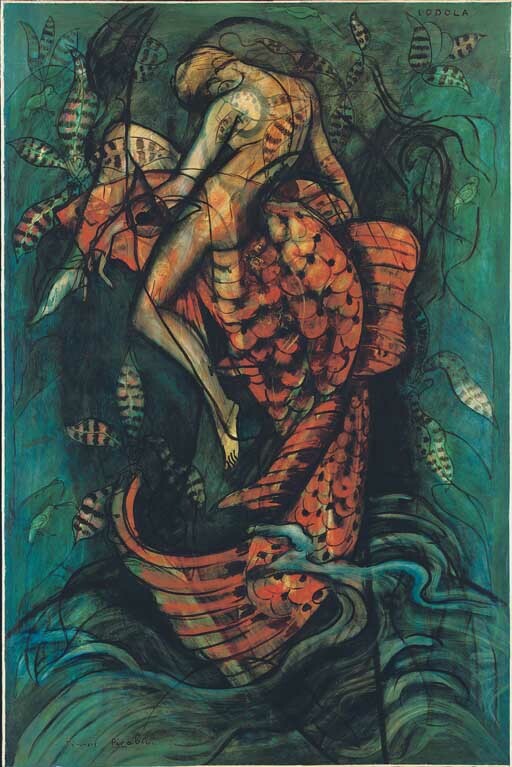 Santiago de Compostela, Museo do Pobo Galego, Francis Picabia, o sono Español, June - July 1996, no. 40 (illustrated); this exhibition later travelled to La Coruña, Palacio Municipal de Exposiciónes Kiosco Alfonso, July - August 1996. Lisbon, Centro Cultural de Belém, Francis Picabia antologia, June - August 1997, no. 73 (illustrated). Paris, Galerie Piltzer, Francis Picabia, September - October 1997. Vence, Galerie Beaubourg, Francis Picabia. Classique et merveilleux, July - October 1998, no. 117 (illustrated). Tokyo, Isetan Museum, Francis Picabia, August - September 1999, no. 36 (illustrated); this exhibition later travelled to Fukushima, Iwaki City Art Museum, October - November 1999 and to Osaka, Kintetsu Museum of Art, January - February 2000. The Comité Picabia has confirmed the authenticity of this work. 'My present feeling as regards aesthetics comes from the boredom produced by the sight of pictures that seem to me to be congealed on their immobile surfaces, far removed from anything human. This third dimension, which is not a product of chiaroscuro, these transparencies with their secret depth, enable me to express my inner intentions with a certain degree of verisimilitude. When I lay the foundation stone, I want it to remain under my picture and not on top of it' (Francis Picabia quoted in M.L. Borrás, op. cit., p. 340). Picabia's 'transparencies' are so-called because of their many layers of imagery that simultaneously combine to create an illusional and seemingly impenetrable allegory with all the characteristics of a dream or a mystic vision. They were in part derived from the artist's Cubist and Orphist period, but Picabia had also experimented with such layered simultaneity in the film Entr' acte and in some of his 'monster' paintings of the late 1920s. It was therefore primarily within the context of the cinema that these extraordinary works were first interpreted. Gaston Ravel exclaimed excitedly about the first transparencies when he first saw them that they were 'a miracle! an enchantment and an homage', 'involuntary perhaps, rendered to the cinema' (quoted in W. Caulfield, Francis Picabia: His art life and times, New York, 1979, p. 233). Similarly excited by Picabia's new paintings was the dealer Léonce Rosenberg, who was so impressed that in spite of having been reviled and ridiculed by the artist during the artist's Dada period, offered Picabia an arrangement with his gallery and commissioned a group of paintings for his wife's apartments. Lodola is one of eight panels that Picabia began for this project in 1928 and finished in December 1930. Executed during a period of extreme productivity while living on the Mediterranean coast, the majority of Picabia's transparencies refer to classical themes and conjure a sense of an antique idyll. Indeed, the 'foundation stone' he mentioned with reference to these works was almost always ancient masterpieces from the past that would serve as the basis for the transparency's composition. In the case of Lodola, the founding image is taken from an illustration of Pliny's famous story of a boy and a dolphin. Incorporating this image into the work and building from it in an intuitive way until multiple layers of reality and illusion were visible, the ultimate meaning of the work becomes deliberately obscure and ambiguous but also fascinating. In many of Picabia's transparencies it often seems as if these works were made according to a personal code of imagery that only the artist could recognise and interpret. Indeed, in a statement he made about his transparencies in the introduction for his exhibition at Rosenberg's gallery in December 1930, Picabia, somewhat humorously declared that they were expressions of 'inner desire', ultimately to be read by himself alone. 'I worked for months and years making use of nature, copying it. Now it is my nature that I copy, that I try to express. I was once feverish over calculated inventions, now it is my instinct that guides me... these transparencies with their corner of oubliettes permit me to express for myself the resemblance of my interior desires... I want a painting where all my instincts may have a free course... Those who have said ... that 'I do not enter the line of account' are right. I take no part in no addition and recount my life to myself alone' (F. Picabia: Introduction to the Exposition Francis Picabia , Chez Léonce Rosenberg, Paris, December 9-31, 1930).